Christians are split into two groups when viewing how God deals with mankind over time. The majority believe God only works through covenants and thus the Church is just a New Testament extension of Israel. Those known as “dispensationalists” believe that God works differently at different times and that the Church was a new thing that began about AD 32, setting aside Judaism. In God’s things, the majority usually are wrong. Respected “dispensationalists” often differ on the number of dispensations and where they begin or end. This does not affect the truth of dispensationalism: it is a detail. Mr. F.W. 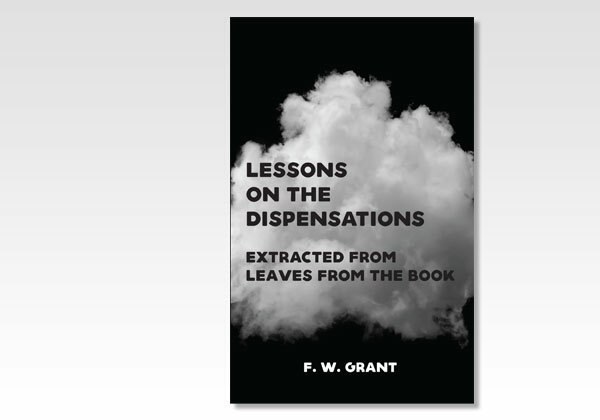 Grant (1834-1902)—a definite dispensationalist—even seems to question if the Church is a dispensation. He breaks down the dispensations as he views them in logical steps in a sequence that ends with the future 1000-year reign of the Lord, although he carries us into the eternity of the future in his last chapter. Mr. Grant was born in London, England, but lived much of his life in the Toronto area, finally moving to Plainfield, N.J. and thus was considered by many as an American teacher of the Word. We believe you will enjoy the thoroughness of his presentation, edited for clarity.